Disney‘s live-action version of DUMBO flies high and low. Taking inspiration from Disney‘s 1941 animated classic of the same name, DUMBO is a live-action retelling of the timeless tale of a baby elephant who overcame the odds to save his owner’s (Danny Devito) floundering circus, giving it new life when it is discovered that he can fly. 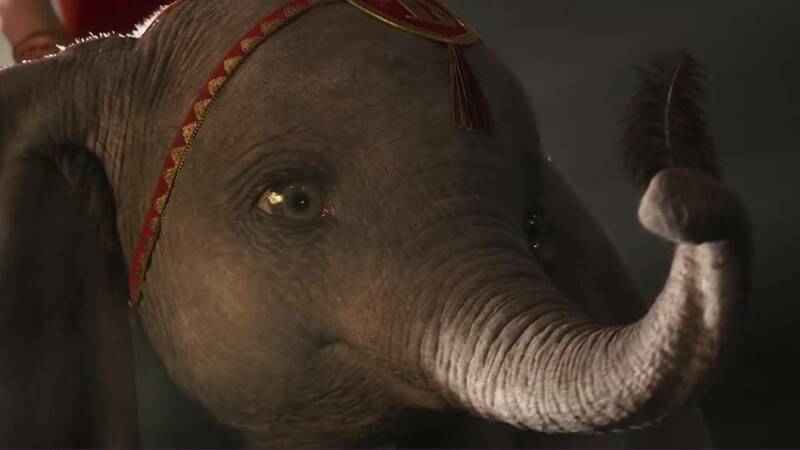 Dumbo, as he is named unfortunately, is taken under the guidance of Holt Farrier (Colin Farrell), an amputee war veteran and his two children, Milly (Nico Parker) and Joe (Finley Jobbins). The latter two make the magical discovery that he actually can fly. Catching wind of this talented tusker, a deep-pocketed entrepreneur named V.A. Vandevere (Michael Keaton) looks to incorporate Dumbo into his grand venture, Dreamland. That is, until some worrisome secrets are uncovered about the establishment. Visionary Tim Burton takes the reins on this gorgeous-looking adaptation and it features front and center once again his signature eye for detail, colour and whimsicality. While the first half of the Film is paced comfortably, the second half of the Film progresses at a rushed pace as DUMBO advances from faltering to mastering his unique ability. Burton captures the central character’s vulnerability and at every point we find ourselves worried whether or not he will succeed. Above all else, Dumbo simply is adorable. The Film has an overarching theme of the absent mother-child relationship between not only the elephant and its captive mother, but also the two motherless children and their bond with elegant Trapeze Artist Colette Marchant (Eva Green) who is paired with Dumbo at her husband Vandevere‘s suggestion. While this should have rung with great sentimentality, we couldn’t help but feel that opportunities to connect us on a deeper level to this aspect of the story went amiss underneath all the high-flying dazzle. And it is because of this, we find ourselves wanting to be even more deeply-affected by Dumbo than we were ultimately. That being said, its noble efforts to progress its source material to an audience of today with its other central theme of animal activism, is commendable or all of this would have been in vein if it were a carbon copy of the original. Green is phenomenal and the Film’s brightest spot mesmerizing us with her grace, while its two child stars leave an impression. Farrell while struggling a bit with his Kentuckian accent, possesses a breakability which is not without charm. Devito to standard, is larger than life, while at moments we feel Keaton might be relishing his villain perhaps a bit more than he should. Dumbo succeeds in many ways, yet also underwhelms in others. That being said, it still warrants a visit with the family to the theatres with its satisfying visuals and important message. Walt Disney Studios Motion Pictures Canada release DUMBO Friday, March 29, 2019.